Find artworks, auction results, sale prices and pictures of Jacob A. Aarlberg at auctions worldwide. Jacob A. Aarlberg, Oil on canvas, 'Skizz', Fishing boats, steam tug etc. 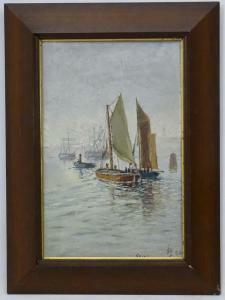 in a harbour, Signed with monogram and dated (18)98 lower right, 18 x 11 3/4"